A 13-story building near the Greensboro Metro station will be demolished later this week. The new development will include the region's largest Whole Foods. TYSONS CORNER, Va. — Developers working on a massive project in Tysons Corner are set to swing a wrecking ball into a 13-story building near the Greensboro Metro station, making way for a new mixed-use community. The demolition is scheduled to happen on Wednesday. 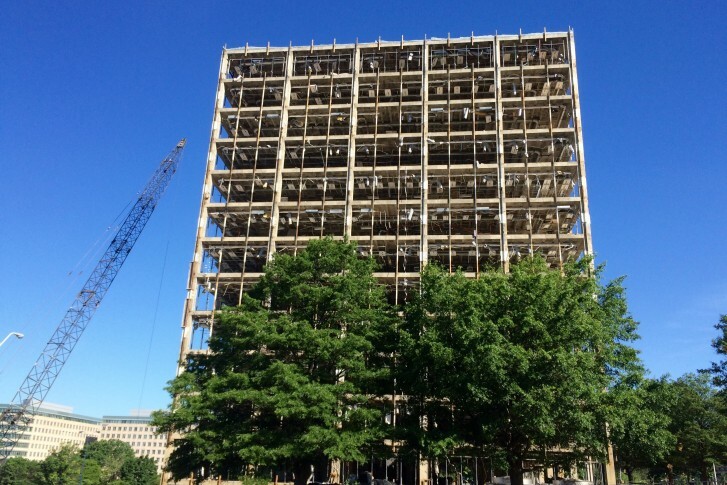 “We’re going to knock down this big building over the next two weeks,” said developer David Cheek, president of The Meridian Group. When it is all done, the 4.2-million-square-foot development known as “The Boro” will feature five apartment buildings, three office towers, a hotel, a movie theater, a public library, seven parks and retail space that will include the largest Whole Foods in the D.C. area. “Tysons is probably the largest mixed-use transformation occurring in the United States,” said developer Bob Kettler, CEO of Kettler. Construction will begin in the fall, and the project will take several years to complete.